253/365 – “Metamorfoodist” nr.11, a photo by Luca Rossini on Flickr. 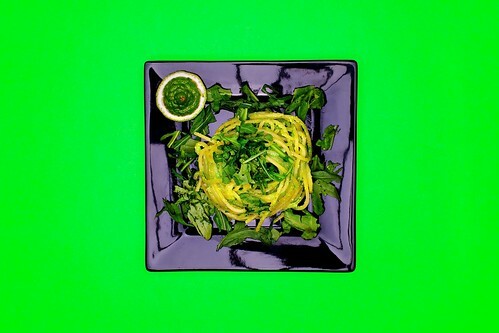 Spaghetti with Zucchini Pesto and Lime served with Maltagliati of Arugola and Parsley (“Spaghetti al Pesto di Zucchine e Lime con Maltagliati di Rucola e Prezzemolo”). Zucchini, once “trifolate” (cooked in oil, garlic and parsley), “sfumate” (simmered with white wine until reduced) and finally whipped, show their “greenest” side, standing even above a touch of parmesan “Reggiano” which gives a sharper taste to the whole. 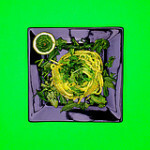 Minced “maltagliati” of parsley and arugola completes the dish with a “tone on tone” effect.